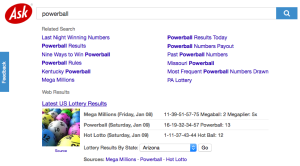 Home/News & Features/Social Media News/Google/What’s the secret behind powerball numbers and search engines? There were more than millions of people who waited breathlessly to find out whether or not they had won the Powerball lottery drawing! There was a predicted $950 million jackpot reward which awaited the winners and search engine activity increased as the lottery drawing occurred and the players went looking for the numbers to know whether or not they’ve won it. 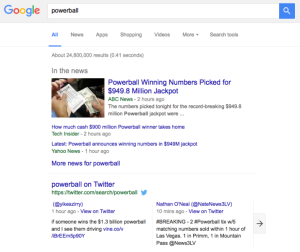 Google Trends has recently showed a huge increase in US search activity for the search term “powerball. How did search engines perform while responding to this spike in search activity? Google: Google didn’t answer that search activity with a definite answer showing those winning numbers. The snippet under the first result appears to cut off at a definite moment right before the winning numbers showed up. If that particular snippet continued for a few more characters, Google would have showed the winning numbers with its initial search result. So, to see it technically, Google has the winning numbers on the first page. Google has a habit of handling queries in this manner. 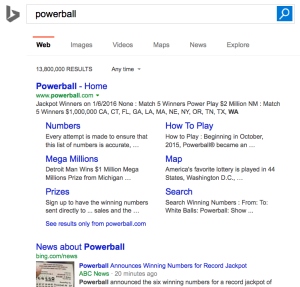 Bing: Just like Google, Bing too doesn’t have any answer box which shows the winning numbers. Like Google, the only place where you can see them on Page One is in the search result snippet which is located below the fold. 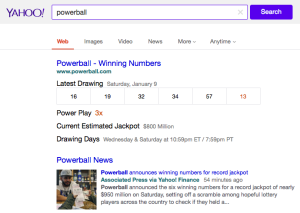 Above that fold, Bing only shows the Powerball website and the beginning of a news result. So, how do you know who is winning the Powerball numbers for the popular search term? Yahoo: Undoubtedly, Yahoo has the best search engine results than all, with the winning numbers showing right at the top of the page. The data that it showed for the estimated jackpot was around $150 million less but that figure kept on changing rapidly as the tickets were being bought. So, this could mean Yahoo cutting down on some marks! Ask.com: People have stopped considering Ask.com as a worthy search engine long time ago but nevertheless, people felt compelled to check it once on that night. Definitely, Ask had the results and even some more, right within the lottery result answer pack. Apart from the search engines, Powerball was also listed as one of the top trending stories on Facebook as well. The winning number wasn’t shown on the right-hand side of the Facebook page but when you clicked on the News Feed, there was a longer description of this historical event.